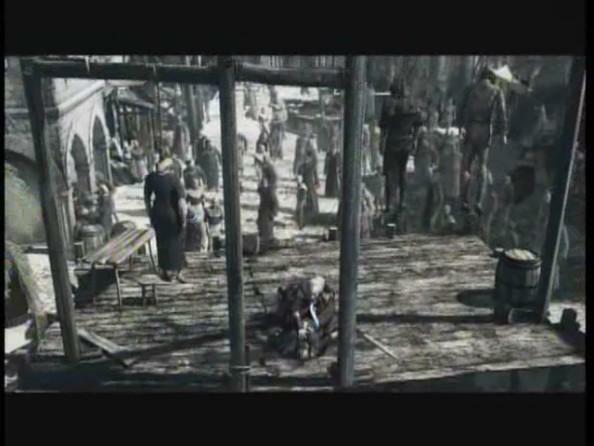 You know the trailer that plays when you first load ASSASSIN'S CREED where Altaïr executes the executioner? Some have complained that the scene never occurs during actual gameplay. Well, it sort of does. Majd Addin holds a public execution on a stage in Jerusalem. The degree to which his assassination resembles the one in the trailer is up to you. 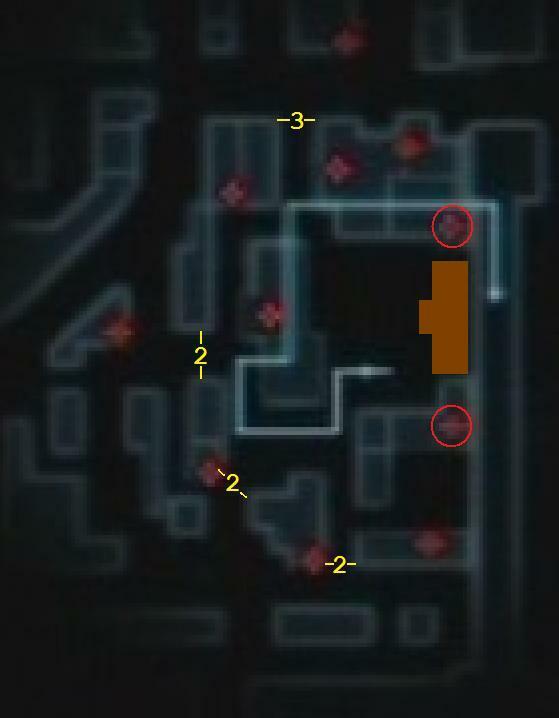 Only the Pickpocket mission below flag #17 on this map turns up good information. It's a map of where all the archers will be stationed during the execution. Warning: The map is oriented so that west is up. Below I've reoriented it and added the locations of the platform and guard posts. I have no idea what the blue arrow represents as there's no way to get behind the stage. There's only one Scholar to be saved in the entire Poor District of Jerusalem and he's right in front of flag #10. This is another "two-fer": save this citizen and you'll earn two sets of Scholars. One goes from here into the execution area. The other waits in the bullpen to the right of the crowd during executions, facing the stage. They are prepared to help Altaïr through the guards and onto the stage. This is going to be a chaotic escape, so I recommend saving some other citizens in the eastern part of the Poor District. This serves the dual purpose of setting up some Vigilantes and reducing the number of guards who might join the chase. The best positioned citizen to save is the one just southwest of the Scholar mentioned in the previous paragraph. Another good one is actually in the Rich District on the way back to the Assassin's Bureau. Complete three Investigations and return to Malik. The execution area is protected by a ragtag assortment of two and three man guard posts (see yellow 2's and 3 on the map). There's a major advantage to approaching the area by rooftop in that you can clear as many archers as you like before the assassination begins. The exceptions are the two archers nearest the execution stage (circled on map). The one to the north respawns during the cutscene. You can kill him now but you'll just have to kill him again later. The one to the south doesn't appear until the cutscene (he's the one who shoots the Scholar that rushes the stage) and then he spontaneously disappears if Altaïr dies. These happen to be the two archers who are most likely to interfere with the actual assassination. The main reason to clear other archers is to aid in the escape. Decide on an escape route and pre-assassinate the archers along it using Throwing Knives or the Hidden Blade. Most players prefer to flee by hopping rooftops west from the execution stage. That's a fine plan. Be careful not to get too close to the execution area until you're done with your pre-assassination cleanup. When it says, "Ancestor's memory synchronized. Now recording." you have no choice but to begin the assassination. 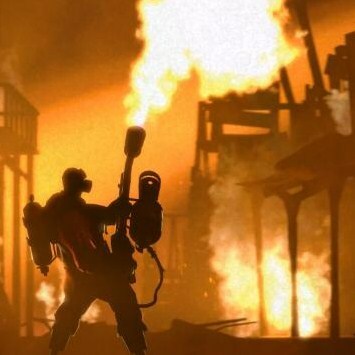 If you happen to be on a rooftop when this happens, remember that you won't be able to climb down ladders. Instead, use the B button (Circle on PlayStation 3) to drop over the edge and take your place among the crowd. Majd Addin takes the stage like a rock star. He introduces four prisoners to be executed from right to left: the harlot, the gambler, the thief and the heretic. Actually he misspeaks and confuses the gambler with the thief. It's an easy mistake to make. Anyway, the heretic is an undercover assassin. This mission is the only one in the game with a time limit. 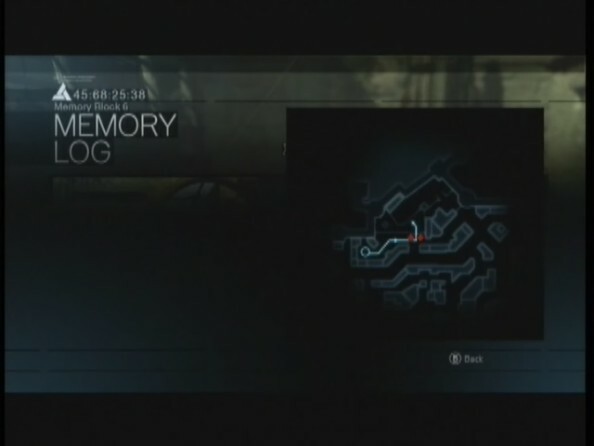 Altaïr must complete the assassination (or worse, become Exposed) before the fourth prisoner is executed. Majd Addin is so longwinded that it takes 3 minutes and 18 seconds before this happens. Altaïr has enough time to swing by the Bureau and enjoy some falafels with Malik if he so chooses. Two solo guards work the stairs at the left end of the stage. An arc of eleven guards form a wide post across the front of the crowd. A guard patrol roams back and forth in the rear of the courtyard. At the left rear is a beggar. Several trouble makers prowl among the crowd and nearby alleys. Be sure to Blend when the guard patrol comes your way. Try to stay clear of the trouble makers. They can blow your cover faster than anyone else. 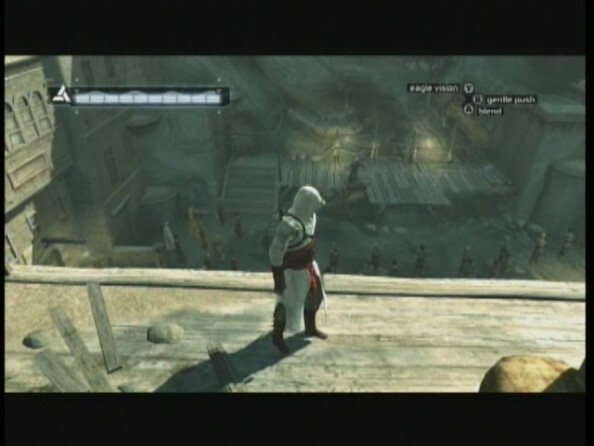 In the trailer, Altaïr pushes his way to the front of the crowd and performs an air to assassinate off the corpse of a guard. That's not going to happen here. However, you can do an air to assassinate from either side of the stage. I'm going to walk you through the one from the left hand side of the stage (i.e. the north, to the crowd's left). From this side, you have to wait until Majd Addin addresses either the thief or the heretic/assassin. Now, some people are saying, "This mission isn't a success unless you save all of the prisoners." and to those people I say "bite me". Remember how many prisoners Altaïr saves in the trailer? Zero, that's how many. Three bodies swinging from ropes. Malik says to save the assassin. That's good enough for me. There will be an archer on the roof to the right of the stage. He's conveniently absent in both of these videos (which indicates Altaïr died on the first attempt). You can't do a simple "high profile air to assassinate" while standing flat-footed on the roof. Instead, stand clear of the ladder and use a "running air to assassinate" as described here. Okay, on with the walkthrough from the left. Make your way past the beggar and climb the tall ladder on the north wall. Turn right and climb part way up the next ladder, keeping your head below roof level. You may not be able to see him yet but there's an archer who walks around three sides of that cube thing (it looks like this one). Wait until he comes around to the near side and stops. Finish climbing the ladder and take him out with a Throwing Knife or the Hidden Blade (high profile is okay). Move around to the far side of the cube, turn right, and climb down the ladder. You now have a good view of the stage. Arm your Hidden Blade and wait here on this roof until you're ready to make your move. After executing the gambler, Majd Addin temporarily sheathes his sword and moves out onto that tongue at center stage. Target him by pulling the Left Trigger (L1 on PS3). He's still too far away to assassinate at this point. You can choose to strike anytime Majd Addin comes to the near side of the stage as long as he's not looking in Altaïr's direction. My favorite time is right after he says, "Today a dinar, tomorrow a horse, the next day another man's life." It's poetic justice . Perhaps you find it more dramatic to save the heretic at the last second. Be sure to listen to what the thief says. His voice makes me laugh. Below is a complete dialogue guide so you can time your attack. Contrary to popular belief, Altaïr doesn't die immediately after his fellow assassin is executed. Majd Addin still has a few closing remarks he'd like to make after that. No wonder he got into politics. Temptress, succubus, whore. She goes by many names but her sin remains the same. She turned her back on the teachings, defiled her body to advance her station. Each man she touched - forever stained. This man speaks lies. I am here today not because I laid down with other men for I did not. He means to murder me because I would not lie down with him. Even now, offered redemption, she continues to deceive. She rejects salvation. There is only one way to deal with this. A game of chance condemns me to death? Show me where such a thing is written. It is not sin that corrupts our city but you. This man took what was not his, money earned through the labor of another. It could have belonged to any of you and so you have all been violated. What say you to this? It was a single dinar found on the ground! He speaks as though I trespassed, as though I ripped it from the hands of another. Today a dinar, tomorrow a horse, the next day another man's life. The object itself is not of consequence. What matters is that you took what did not belong to you. Were I to allow such behavior then others would believe it their right to take as well. When would it end? He spreads vicious lies and propaganda, has only murder on his mind. He poisons our thoughts as he poisons his blade, turns brother against brother, father against son, more dangerous than any enemy we face. Killing me would not make you any safer. I see the fear in your eyes, hear the quiver in your throat. You are afraid - afraid because you know that our message cannot be silenced, because you know we cannot be stopped. ...and so it is done but do not think that we are freed from sin. So I say to you, "Watch yourselves, watch one another, and stay strong in your faith. Together we shall restore righteousness to the land!" Deliver the final blow with a two-step across that wooden beam. The first step is just a regular Free-step move: Right Trigger + A + Left Thumbstick up (on PS3: R1 + X + up). Continue holding Right Trigger and press X (Square on PS3) to take that second step right into Majd Addin's neck. It doesn't matter where your Left Thumbstick is on the second step, so an easy shortcut is to start with the Free-step and simply move your thumb from A to X (or from X to Square). By the way, you don't want to linger on the beam. Majd Addin will spot you the next time he turns his head your way. During the death cutscene, Altaïr imitates a 1970's street pimp and says something like, "Let me show you my blade." Then he sets an alarming precedent by killing Majd Addin again! All I can say is that Altaïr has a lot of nerve to attend the guy's funeral after killing him twice. You're going to have to improvise at least part of this escape. I can't prescribe a surefire route. A good place to start is that ladder at the south end of the stage. If you climb the ladder and continue to the south, right away there's a leap of faith into a haystack. Unfortunately, that's usually not enough to become Vanishing. The guard presence here is just too heavy. I show the haystack in the video but you're probably better off sticking to the rooftops until you clear the guard posts around the execution area. My idea of a stylish escape is to lose my pursuers and then Vanish into some Scholars. After all, that's what Altaïr does in the trailer. There are several sets of nearby Scholars to consider. The closest are the ones by flag #10. However, they head back to the execution area - right where you don't want to be. The other Scholars don't come from saving any citizens. You get them for free and they aren't on your map/GPS. One group circles the synagogue where you find flag #20. That's cool because the Scholars in the trailer emerge from a church. However, the ones I prefer walk the south end of the Rich District. They usually hang out just south of flag #33 but I've included their whole route on the map just in case they're on the move when you need them. In the video I pre-assassinate some archers to the west but wind up escaping by ground instead. Oh, well. You should have wrote the Majd Addin chapter in The Secret Crusade, because Oliver Bowden opted for a rush-on-stage assassination. What makes me laugh during the death cutscene is when Majd asks "do you know what it feels like to determine another man's fate ?" to the man about to kill him again. LadyVe did something like that. She wrote a full length fanfic novel called Written in Blood that follows the plot of AC1 and introduces an original female assassin character. Many of the assassinations portrayed in the novel were taken from my Stylish Assassination video series (but not this one - Majd Addin).